A nine-person band devoted exclusively to playing original holiday songs, the Ohio City Singers started out as an informal collective of musicians. It’s slowly emerged into a festive enterprise. This year in addition to playing several shows around Northeast Ohio, the group has released A Town Called Christmas, a new album of eclectic tunes that celebrate the season. 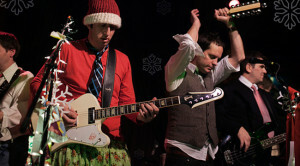 The group will also release its own special “Snow Day” beer and reissue 2011’s Love and Hope on vinyl. We spoke to front man Chris Allen about the band. In 2004, I was living in Ohio City. My dad was a big Cleveland kind of guy. He wanted me to write a song and make it Cleveland-centric. So, my sister and I decided to write a bunch and have a house party as a surprise. I invited all these guys. We handed out lyric sheets and everyone brought a bunch of food. It was the best Christmas party ever. We recorded it the Sunday before Christmas and we mixed it then next day. We had 40 copies to hand out to friends and family members on Christmas day. We called it Real Good Christmas Time. We played “Merry Christmas Baby” at the party and the whole place was going crazy. It was incredible. That year, I gave the disc to my dad. At first he thought it was a mix tape and then he realized we made it. He couldn’t stop listening to it. We kept holding house parties and recording them. We had five of those recordings by 2008 and we wanted to do a real album. [To do that] the band recorded all the tracks live and instead of having the audience there when we sang the songs, we brought the tapes to the Happy Dog and had everyone sing along. The problem with house parties is that if the band doesn’t get it on the first take, people get restless and start wandering around. You want that energy of everyone singing it at the same time. What makes a good holiday song? That’s a good question. I don’t know if this is an answer, but when we first started doing the songs, I started writing them on the piano. That added a lighter, melodic element. We start with the title and melody and then work everything else into it. But we rock it. We try not to subscribe too much to what a Christmas song should be. It doesn’t have to have sleigh bells. Our one rule is that the song should be positive and convey something about what we love about this time of that time of year. What is your favorite Ohio City Singers’ Christmas song? I lean back to “Real Good Christmas Time.” We did it in one take and everyone was singing it. I get the chills thinking about it. I knew it was really working. That’s one of the first songs we always play. We would never do a Christmas show without that song. My favorite Christmas song is the “Christmas Song” as sung by Nat King Cole . . . To me, he is Christmas and that’s the greatest song. My favorite Christmas song is the “Christmas Song” as sung by Nat King Cole. He was playing non-stop in my house when I was a kid. To me, he is Christmas and that’s the greatest song. We don’t play it. Now we only do a few covers like “You’re a Mean One, Mr. Grinch” and “Heat & Snow Miser.” “But Nat King Cole’s is the perfect Christmas song. How did Don Dixon get involved? He came along when we were doing our first real album. I needed him to organize the chaos. He’s good at capturing what we sound like. He’s good at orchestrating the backing vocals. It takes a lot of time and concentration. They’ve gotten more and more complicated. We have 10 people who can all sing. You have to make the most of that. He was really good at tightening that down. It’s nice because we can record anywhere. He can bring that gear and get it down and mix it. As he was producing it, he would add things like glockenspiel. Nobody else had a glockenspiel so by default he became our glockenspiel player. He’s filled in on keyboards. I always wanted to have a multi-instrumentalist. He’s the king daddy of extra flavor. Does he always dress as Santa? It’s hard for local bands to get played on radio anymore, but Ohio City Singers are part of the holiday marathons. How has radio support helped? It’s been huge for us. It’s brought new people out to the shows. We’ve become a tradition for a lot of families. It’s nice to hear Nat King Cole and then hear “Snow Days.” One year on Christmas Eve, we were putting up my mom’s tree and “Snowflake” came on the radio. We thought that was cool. Even though you play seasonally, do you have to work on this year-round? I’ve been living Christmas all year . . . I didn’t do a solo album this year. Austin [“Walkin’ Cane”] and I got together every Monday starting in January. 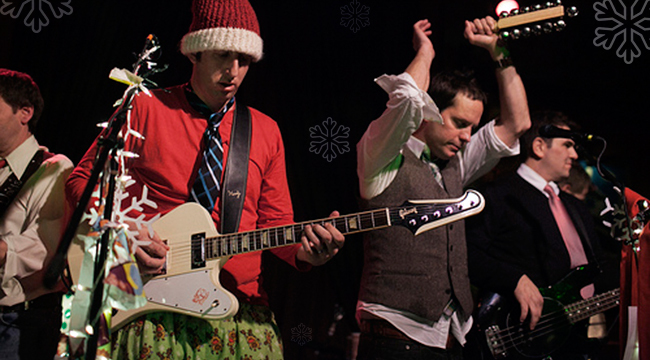 We recorded in May and finished in June and started doing “Christmas in July” parties. Started rehearsing and did a show November 1. We just did a thing with a 90-piece youth symphony in Kettering, Ohio. I didn’t reinvent the wheel [with our beer]. I just made a bowl of stuff that felt like Christmas and we wrote down the amounts. You have your own beer? I made a “Snow Days” Christmas ale last year. Now, the Portside Distillery is brewing it. They’ll be serving it up this season at The South Side and we’ll have it at our Roc Bar show on December 21 when we’re recording a live album. Dixon called me the other day and asked, “What’s going on?” I told him I was still waiting on the disc. He said, “No, with the beer. Anyone can put out a CD.” It’s a malt with some Christmas seasonings and ginger and honey. I didn’t reinvent the wheel. I just made a bowl of stuff that felt like Christmas and we wrote down the amounts. I’m excited about it. Why do you like this time of year so much? I do love Christmas. I wouldn’t be writing these songs if I didn’t. It was really special when I was growing up. I love the snow. I love the season. I love the whole thing. We have so many people come up and tell us that our songs have become their kids’ Christmas music. Now it’ll become a tradition for my own family.